Revising. How often does it get shuffled to the back of the writing line, skimped, or morphed into glorified editing? Probably a little too often. But revising has the potential to be a powerful part of student writing, where opportunities to grow as writers are thick. In my last post, I gave you a plan to change the classroom writing culture so that revising played a significant, vital part of student writing. I also promised you specific, practical revising strategies that would help students get the most out of this part of the writing process, and in turn, help get the most out of their writing. 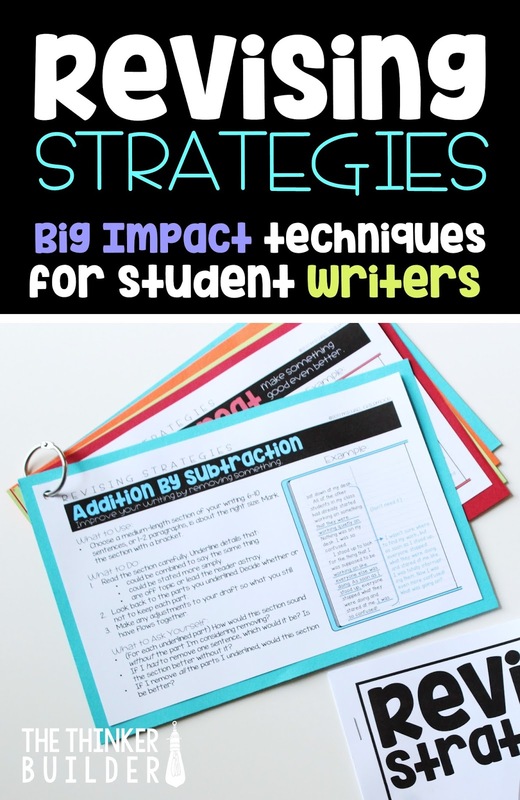 Well, here they are: twelve "big impact" revising strategies to introduce to your students. Each one jives really well with a one-column rough draft format, which you can read about in my post called Rethinking the Rough Draft. It's a simple change but will help set the stage for students to implement these revising strategies. Students mark a bracket around the first few sentences of their rough draft, narrowing their focus to just the beginning of the piece. They read this marked section carefully and think about the feeling they want to give the reader and how to grab their attention. Then students try rewriting their beginning differently. (It's important to emphasize with students that even if they like their beginning, to go ahead and try writing it differently because they might stumble onto something even more successful.) After a rewrite, students ask themselves a series of reflection questions: Which beginning gives the right feeling to my reader? Which beginning grabs my reader's attention more? Which beginning makes my reader want to read on? Have I chosen the right place to start? Do I need to back up? Do I need to skip ahead? Students mark a bracket around the last few sentences of their rough draft, narrowing their focus to just the ending of their piece. Similar to "Lead the Way," students read their ending and think about the feeling they want to leave the reader with and how to bring the piece to a close. Would an unexpected ending be a good choice? Would an ending that summarizes information be a good choice? Then students try rewriting their ending differently. Afterward, students think about which ending would be more satisfying to the reader. Students choose a medium-length section, around 6-10 sentences, of their writing in which they like. They read the section carefully. They think about what they like about it and if there's a way to do it even more. Then students try rewriting the section. Since they already like what they have, students are encouraged to take some risks with the second attempt. They can always choose to keep their first attempt, but you never know, they might go from good to great! After the rewrite, students ask themselves a series of reflective questions: What did I write in my second attempt that is strong? What did I write in my second attempt that didn't work as well? Which attempt do I want to keep? Or are there parts of both that I want to use? With a medium-length section of their draft, students read carefully and underline details that could be combined to say the same thing, could be stated more simply, or are off-topic or lead the reader astray. Then students look back at the parts they underlined and decide whether or not to keep each part, asking themselves: How would this section sound without the part I'm considering removing? If I had to remove one sentence, which would it be? Is the section better without it? If I remove all the parts I underlined, would this section be better. Afterward, students make any other needed adjustments so the draft still flows together. Students choose a small section of their writing (a few sentences or one paragraph). After reading it carefully, they find one place to add a whole new detail sentence, and one more place to add two whole new detail sentences. To help find places to add details, students ask themselves: What part of this section could I explain or describe more? How can I use my senses to add more details that "paint a picture" for my reader? With a small section of their writing, students first look for a word they remember choosing carefully, putting a start nearby to show it off. If they don't find one, that's okay! Then students find three more places to choose a word that is the perfect fit: an exact word, a special word, a word that is "just right" for the situation. They might replace two words with a single perfect word, or add a describing word, or change a word for one that better shows or describes what they want. With a medium length section of their writing, students use their pencil to track the words as they read them out loud. It's important that they are able to hear their own voice. As students read, they pay attention to their voice. For any parts they stumble on, get stuck on, or even have to pause at, they underline them, thinking of them as rough spots that need smoothing out. Then students rewrite the section, revising the underlined parts so that when they read it out loud again, it's easier to read smoothly. Afterward, students ask themselves: Is my revised section easier to read now? Are there any parts that need touched up a little more? Students choose a small section of their piece and read it carefully, being sure to get the full gist of what they wrote. Without looking back at the chosen section, students rewrite it. They can change a little or a lot but they make sure it still connects to the sentence before and the sentence after. Students then read their "second take" and without looking back they rewrite the section for a third time, trying to make it even better. Afterward, students reflect on questions like: Which of my three "takes" do I think is the strongest? Are there bits of one take I like and bits of another I also like? Should I try one more take to blend them? Do I need to change anything to make this section fit back into the whole piece? For this strategy, students use their whole draft. As they read it, they look for places where there seems to be a hole. They mark these places in the margin with a circle. Maybe they find a gap in their story or they simply forgot to tell a part. Or maybe they realize they jump from one part to another too quickly. After reading and marking their draft, students revisit the places they marked and write the missing pieces so the holes get filled. Afterward, students ask themselves: Have I closed the gaps that need closing? Was I careful to only add details that help make the piece more clear? Students use their whole draft for this strategy. Before doing anything else they think carefully about the purpose of their piece as a whole... Why did they write this? What is this piece truly about? What did they want to make sure their reader knows or feels after reading it? Next, students read their draft carefully, pausing after each half-page to decide if the section is on track with the big picture they thought about before beginning. If they think the section might be off-track, they mark the margin with a circled question mark. Students then revisit the places they marked and make revisions to bring them back on track, asking themselves: How can I change this section so it fits better with my purpose? How can I get it back on track? This is a partner strategy. Students split their draft into four sections, using the margin to number each section, 1-4. Then they trade drafts with their partners. Students read each section of their partner's draft, thinking about what's working well and what might not be working as well... How easy is this section to understand? How easy is this section to imagine in your mind? After reading all sections, they choose which section is working the best and they tell their partner why they think so. Then they choose one section that could use a little more work and tell their partner why they think so. Partners then trade back drafts and reread the section that might need a little more work, revising it where needed, asking themselves: How can I make this section work better? Why did my best section work so well? Can I use any of those strategies here? This strategy is a spin-off of the other "smooth it out" strategy, adapted to partners. Students trade drafts with their partners and sit side by side. One partner reads one page of the draft out loud (we'll call this partner the reader) while the writer of the draft follows along. For any spot where the reader stumbles, gets stuck, or that the writer has to explain, the writer marks the margin of the draft with a dark dot. (The writers do not attempt to fix or revise these spots while their partners are reading. They just mark the margin for now and let their partners continue reading.) After one page, students change roles, working with the other person's draft. Students then trade drafts back to the owners and revisit the spots marked in the margins of their own drafts. 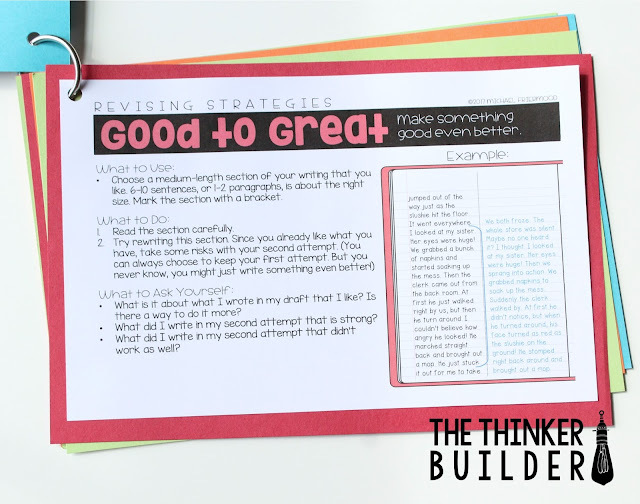 They make choices about what needs to be revised in order to smooth out the writing. Some spots might be a quick fix or change, and other spots may need a bigger revision. You'll notice that most of the strategies have students isolate a portion of their draft with which to revise. 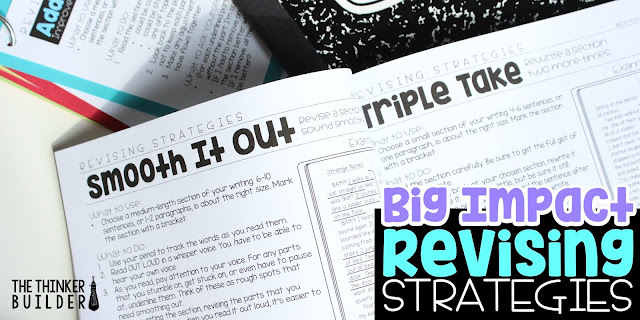 Putting serious effort into revising can quickly become overwhelming, but when balanced with just a bite-size chunk of their draft, it's much easier for students to be in the right frame of mind. They can always (or you can always have them) apply the same strategy to additional portions of their draft if needed. 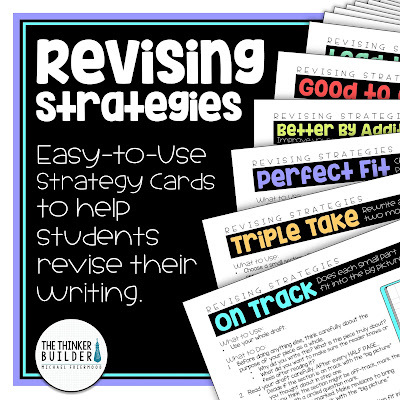 Be sure to check out my full pack of revising strategies, including all twelve you read about here, plus four BONUS strategies, all designed on handy half-page cards. Each card breaks down the strategy into sections: What to Use, What to Do, and What to Ask Yourself. Then I include an example of using the strategy so students can have some context and see the logistics of implementing it. Print and laminate the cards and stick them on a ring, or create mini-booklets for each student! The resource comes with color and blackline versions of all the strategy cards, as well as helpful posters for student reference, booklet "accessory pages," and teacher notes. Click HERE or the image below to check out the resource in my TeachersPayTeachers store. 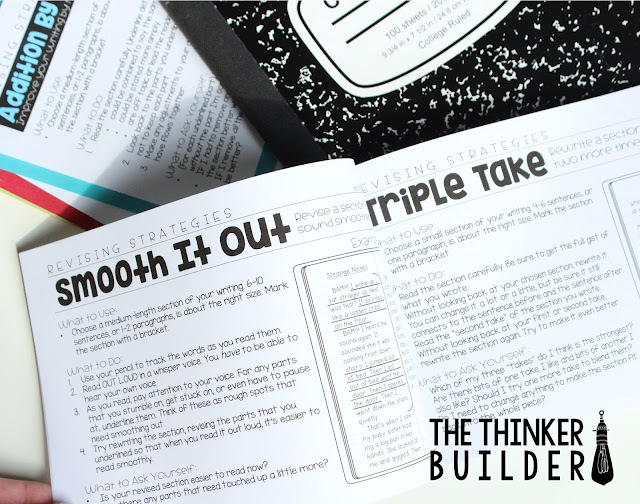 These strategies also show that revising hard is much more than a little tweak here and a little tweak there. Trying to make your writing better comes in a variety of actions. 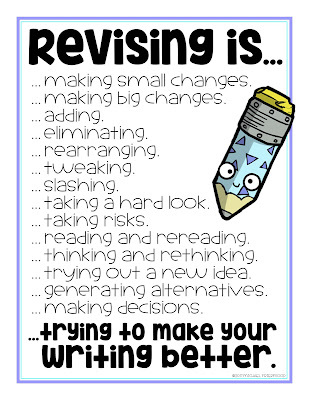 To help drive home this way of thinking, I made the "Revising Is..." poster shown below. You can download it FREE by clicking HERE. Whether it be by discussing and displaying the poster, teaching your class one (or all!) of my revising strategies, changing the format of how students draft, or breaking down one revising's status quo obstacles, I encourage you to take a purposeful step forward into the powerful world of revising.